By Scott Gilfoid: WBC heavyweight champion Deontay Wilder’s manager Shelly Finkel says Anthony Joshua’s promoter Eddie Hearn never seriously wanted to make the Joshua-Wilder fight next for September. Finkel says Hearn had a two-fight deal for Wembley Stadium in London, and he was just looking for a way out of having to make the Joshua vs. Wilder in 2018. 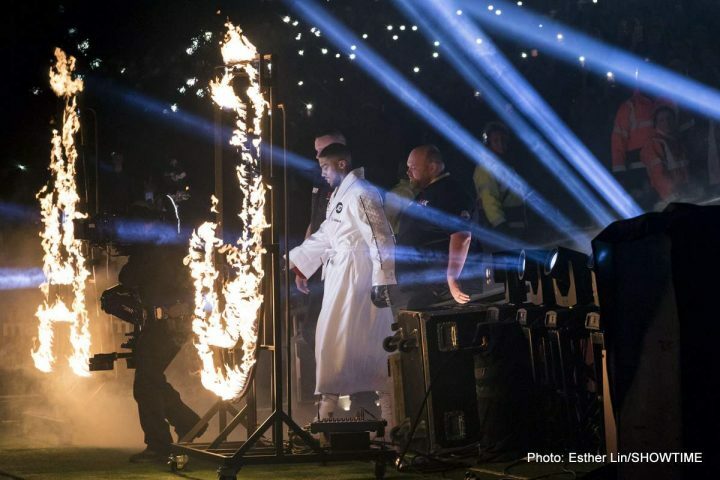 The way out for Hearn and Joshua came when the World Boxing Association gave a 24-hour deadline for Joshua-Wilder negotiations to be concluded. The deadline passed without Wilder signing the contract, as Hearn had never given a date or a location of the Joshua-Wilder. Finkel was also unhappy with the one-way rematch clause that only worked in Joshua’s favor. If Joshua lost to Wilder, he would get a rematch. If Wilder was beaten, Joshua could move on. Finkel wasn’t happy with that obviously. It looks weak on Joshua’s part after the way he asked for $50 million for the Joshua fight. When Wilder’s management came up with the $50 million, but then Joshua still doesn’t take the fight. It looks weak from the fan’s perspective. Joshua isn’t going to make $50 million for his defense of his WBA title against mandatory challenger 38-year-old Alexander Povetkin in September. That’s not a fight that will increase Joshua’s popularity in the boxing world. Joshua would have been better off calling the WBA’s bluff by letting them strip him of his WBA title if that’s what they wanted to do. Joshua could have then fought Wilder and gained much more prestige and popularity from the boxing fans if he won the fight. Joshua turned down arguably the biggest purse ever offered to a heavyweight world champion. The question is why did Joshua turn down $50 million? If his backup plan was a fight that paid him the same or better, then it would be understandable why Joshua didn’t put pen to paper, but that’s not the case. Joshua isn’t getting anywhere near the same money to fight Povetkin as he would have if he’d simply accepted the huge guaranteed offer from Team Wilder. ”They asked us for $50 million, Joshua did,” Finkel said. ”They then asked up to prove funds and we said, ‘Fine, give up your lawyer’s number.’ They never gave it to us. They then raised the offer from $12.5 to 15. We said, ‘we accept. Send us the contract.’ Then the contact comes out and it has no date for the fight, and no arena for the fight. The rematch clause says if he loses, we redo the fight. If he wins, he doesn’t have to fight us again. I then asked him when and where the fight is. He never answers. He send back, ‘I’ll supply you the dates. He gets [WBA president Gilberto] Mendoza to send us a letter that he’s got to tell by tomorrow.’ He never said, ‘Shelly, we only got 24 hours. If you really want the fight, we can do it September 22 at Wembley. He never said, ‘yeah, you’re right. It should be a two-rematch [deal], but it would have to be at Wembley.’ They never said any of that. They did not want the fight,” Finkel said. was working out a deal with Wembley Stadium for September 22 or 29, then they didn’t he give the date and location for the Joshua-Wilder fight when Finkel was asking him for that information? I mean, it looks incredibly bad, as if Hearn never seriously was interested in making the Joshua vs. Wilder fight from the beginning. Finkel obviously believes that. What is particularly disappointing is that when Finkel agreed to the $15 million offer from Hearn, he was still NOT given the date and location of the Joshua fight. Finkel had agreed to the $15 million flat fee offer, which obviously is far less than the $50 million guaranteed offer given to Joshua, and yet Hearn still didn’t give him the location and date. The next thing you know it, the WBA steps in with a 24 hour deadline and the negotiations are finished. Finkel says he doesn’t understand why Hearn didn’t make an effort to get the fight done in a hurry when the WBA gave them a 24 hour deadline. He thinks it was obvious at that point that Hearn didn’t want the Joshua vs. Wilder fight. ”I also think it’s a stupid fight to fight Povetkin now,” Finkel said. It’s hard to disagree with Hearn that the Povetkin fight is an incredibly dumb one for Joshua to be taking in September instead of the Wilder fight. Not only does fighting Povetkin bring a risk of Joshua potentially losing, but it’s also a much smaller payday for him. As I mentioned previously, Joshua’s popularity won’t increase because he didn’t lose his WBA title by having it stripped for not defending against Povetkin. Career-wise, Joshua gains more by fighting the best in boxing rather than holding onto paper titles that the casual fans couldn’t care less about. The only thing the fans care about is a champion having one title for them to be called a champion. It’s a complete waste of time for a champion to win the other belts in the same division if it means that they’re forced to defend against weak contenders that have no name recognition. It’s always better for the champions to go after the biggest names available. If that means they have to lose their titles by having them stripped for not defending against mediocre mandatory challengers, then so be it. They need to take away the power of the sanctioning bodies by ignoring the horrible fights they often push upon them. Joshua could have done that with the Povetkin situation, but instead he and Hearn chose to take that fight and swerve the Wilder fight. It’s a bad look on Joshua’s part for him to bypass the Wilder fight in order to keep his WBA title by taking the much smaller, less important fight against Povetkin. ”They decided and that’s it. Here’s what we want, which is the changes as we said before,” Finkel said. ”Now they’re saying it’s 100,000 seats. They added 10,000 seats for April. I should take the same money but it’s 10,000 more people. Come on. [We want] a percentage of the upside commensurate with the bigger fight. It’s obvious when I asked for the date and the site, he could have gave it, but he didn’t. They were making a two-fight deal wih Wembley, but hey can’ do our deal. I have it in writing where he says, don’t worry, you’re next. I have a fact. I have it in writing. He has a face. He makes it up,” Finkel said. It’s surprising that Hearn isn’t offering Wilder a better financial deal after the seating for Wembley Stadium was increased from 90,000 to 100,000 seats for April 13, 2019. Why is Wilder still being offered the same $15 million flat fee despite the fight having more seating? It sounds unfair that Wilder isn’t being given a percentage split, and his money isn’t being increased from the $15 million flat fee. It almost looks like Hearn still has no interest in making the Joshua-Wilder fight in 2019. When you give him a deal where he’s not able to share on the extra income for the fight, then it tells you that they don’t want the fight.